*Sincere thanks to RS and Purple Valley Imports for the sample. The story, myth, parable, allegory, or whatever you want to call it, of St. George and the Dragon is quite a popular one as far as stories, myths, parables, and allegories go. Ol’ George is one of the more venerated saints in all of saint-dom and…well, everyone likes a good dragon yarn. One version goes that a dragon had taken up residence near a spring or a pond which happened to be the only source of water for a nearby town. The townspeople, instead of checking out some alternate water sources or maybe killing the dragon themselves, just shrugged their shoulders and accepted the fact that if they wanted water, they’d have to slake the monster’s hunger by giving it a sheep, thereby distracting the beast whilst they filled their buckets. If, and this kind of thing seems to happen a lot, there were no sheep available, a young maiden was chosen by lottery and sacrificed instead. On one occasion, a young princess was chosen but before she could be chomped up, St. George came riding up and dealt the foul beast such a painful blow with his lance that it acquiesced to the princess leading it back to town on a leash. Once back in town, Ol’ George, being a good snake-oil salesman, I mean Christian, told (bribed) the town that he would kill the dragon only if they all converted to Christianity. They did, so he did, and everyone lived happily ever after except the dragon and those forced into converting just to get rid of a damn dragon. Now, perhaps I’m taking this all too literally, but, it seems to me like this town was a pretty crappy place to live, especially if you were a young woman or a sheep. I mean c’mon, no one made an effort to find water elsewhere? No one had the stones to get a good group together and deal with the dragon themselves? Lastly, and most offensively, once the sheep ran out, was there no other animals available or good enough to feed to the dragon? Pigs? Goats, maybe? How about a cat or two? Nope, they apparently thought so little of women in this place that after the last sheep was gone, they decided to go right into their stock of little girls. So basically we have the ol’ chestnut about the small guy conquering the big guy with the added agenda of faith playing a big role in the victory. 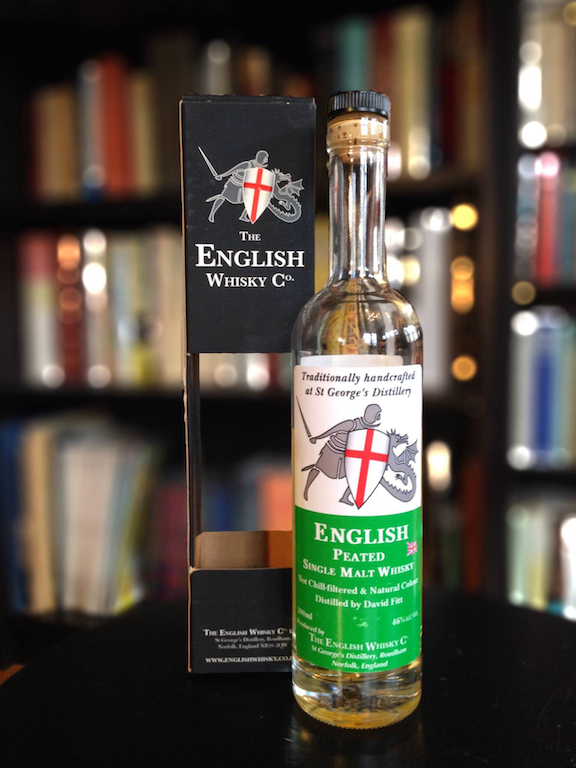 The English Whisky Company’s St. George’s Distillery, inadvertently or not, certainly pays homage to the St. George myth. When the distillery was founded by James and Andrew Nelstrop in 2006, it was the first new whisky distillery to be built in England in 120 years, which made them a smaller English knight going up against the huge Scotch dragon to the north. Initially, Iain Henderson, a former Laphroaig distillery manager was brought on to oversee production. His experience and pedigree helped the company generate high-quality spirit and no small amount of buzz. When he retired, Henderson passed the managerial reigns to former brewer (and fellow bike racing aficionado) David Fitt. The distillery has been releasing several “chapters” of its whisky, both peated and unpeated since the beginning. Chapters one through four were new make and not-quite-old-enough-to-legally-be-called-whisky, with chapter five, released in 2009 being the first legal (over three years old) whisky. Today, they are up to chapter 15 and, as of 2013, with the help of Purple Valley Imports, have brought their first four expressions to the American market. There is currently this peated single malt, a non-peated, “classic” single malt, and cask-strength versions of both, all four being non chill-filtered and non artificially colored. The Nose: Youthful to be sure with a nice malty spirit quality. Upfront, there’s light but pungent, earthy peat, pear eau de vie, and tart lemon icing. This is not diesel-y, brine-y Islay peat, instead this seems like the stuff from a damp, inland moor. Beyond that, there’s under-ripe melon, fresh-cut pine and very light, dry wood smoke. Distant hints of tinned fruit cocktail and greenish woodspice round out the nose. Palate: The peat and smoke are more apparent on the palate, a bit more phenolic and medicinal with slightly heavier smoke. A nice sweetness in the form of pear nectar and lemon curd helps to balance the peat. More nice, malty distillate character comes through along with continued resinous pine grip. Towards the end, notes of salty, smoked almonds, white pepper, and greenish clove comes through along with a resurgent wave of peat and wood smoke. The Finish: Quite drying and tannic, with lingering, peppery peat and that pleasant note of smoked almonds. Thoughts: Youthful peaty stuff is always an adventure and this one is no exception. Overall, this is very nice stuff. It’s definitely has the hallmarks of a young whisky, but it manages to not only incorporate it’s quite good, expressive distillate character into the overall flavor profile, but even showcase it a bit as well. I like the way the vegetal peat and dry smoke grow and progress through the dram. It’s perhaps a little hot and rough towards the end but again, for a young whisky, this is an impressive start. If you enjoy the peaty stuff, this is certainly worth trying. As they continue to build more mature stock and some of the rough edges are rounded off, it will definitely be worth keeping an eye on the English Whisky Co.